amber murray: Preikestolen + the work of Per Kirkeby; two of the most amazing things I have ever experienced. Preikestolen + the work of Per Kirkeby; two of the most amazing things I have ever experienced. For the past two weeks I have been visiting friends and family in London and Haugesund [Norway] and I am pleased to bring back news of these two very inspiring things. If you hurry [by September 6th], you can catch the first international survey of the work of Per Kirkeby at the Tate Modern; visit Preikestolen while you are healthy enough to make the hike. I find it important to give thought to beautiful things such as these since they can give new life to the work – whatever it might be. For myself, I am constantly trying to define what kind of architect/designer I want to be, and having these particular experiences have left an impression on me. I have recently [May 1st officially] started working for myself and find that I don’t want to be just an architect [this is something I have always struggled with actually]; I want to use my management, design, history, artistic, and writing skills to work on complex problems that cover a range of topics. For this reason, learning more about Per Kirkeby was perfect timing. First of all, I am not ashamed to say it, but I actually had to cry a little after walking through the exhibit the first time [… I went back a few times that day]. The scale, color, technique, and range of medium, were all so thoughtfully considered that I guess I just had to weep. The idea that a person put so much human energy into making beautiful things his entire life gives a major sense of relief. 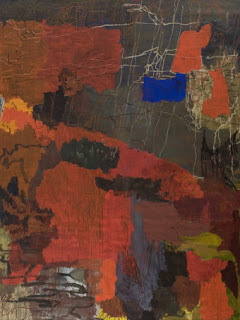 Upon reading further, I learned that although he had a background in geology, he pursued his love of art and has “created an oeuvre that encompasses paintings on hardboard and canvas, blackboards, works on paper, small and large-scale bronze sculptures, ambitious brick structures and actual architecture, as well as an extensive body of writings that bear witness to his exceptional erudition.” - he also looks to various mediums and topics for inspiration and outlets to define what kind of artist he wants to be. 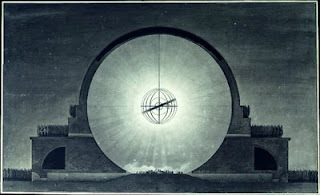 He however finds that essential volumes, especially the sphere, have the volition to convey the awe and perfection that nature inspires, which became his main goal. According to Boullée, we find the arts beautiful because they attempt to mimic characteristics of nature; when something is particularly beautiful, then it comes close to a natural phenomena. One of the advantages that he finds architecture posses above all the arts, due to its scale, is grandeur. Grandeur, which comes close to phenomena in nature, “always pleases us whatever form it takes for we are ever eager to increase our pleasure and would like to embrace the Universe.” This may be why he worked on so many public projects; they needed to be big and, therefore, had the greatest potential to mimic nature. I only wonder if he ever visited Preikestolen. Side notes: There is no record of anyone falling over the side of the cliff accidentally, but there have been several deaths due to suicide. Preikestolen, also known by the English translations of Preacher's Pulpit or Pulpit Rock, and by the old local name Hyvlatonnå, is a massive cliff 604 metres (1982 feet) above Lysefjorden, opposite the Kjerag plateau, in Forsand, Norway. The top of the cliff is approximately 25 by 25 metres (82 by 82 feet) square and almost flat, and is a famous tourist attraction in Norway.